Born in the USSR people remember this slogan “Soviet means excellent!”. This statement, formed in the second half of the 1930s, after the NEP (New Economic Policy), and the period of the first five-year plan and the collectivization came the period of industrial growth. By 1934-1935 has come a stage of stable expansion of the consumer market. 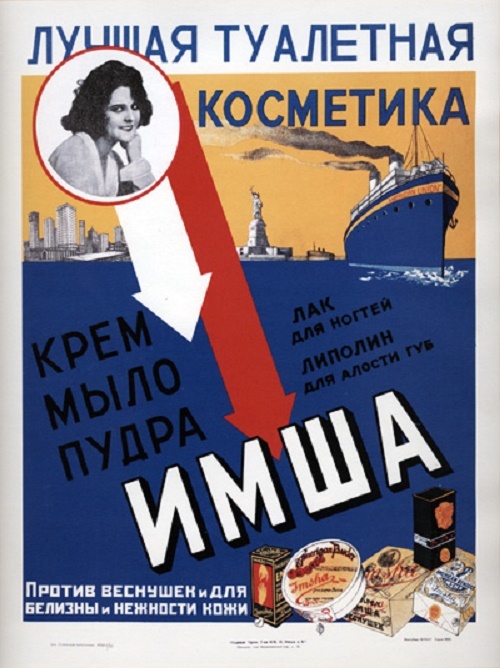 Along with advertising exports, was gaining popularity advertising for domestic trade, created in the specialized art offices. 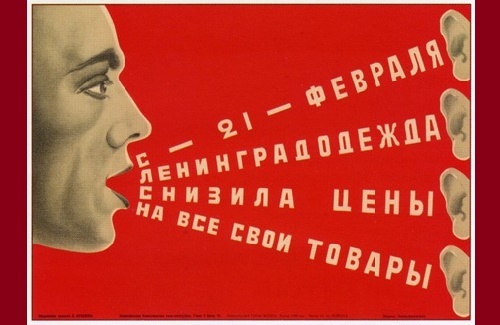 Virtuoso poster artist A. Zelensky (1882-1942) is considered Patriarch of Soviet commercial posters. The same brilliant creative way is characteristic for a young Soviet artist-advertiser of the time A. Pobedinsky (1904-1979). 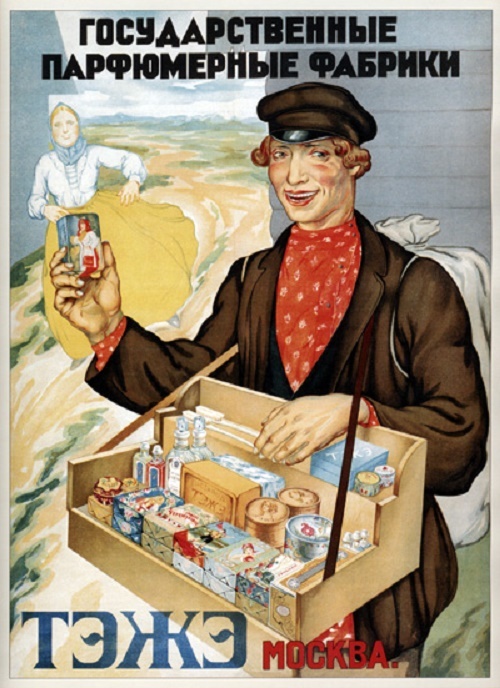 They worked in parallel in commercial poster art – the ice cream advertisement, meat and dairy products, canned food, fruit juice and spirits. Advertising these products is striking in diversity. 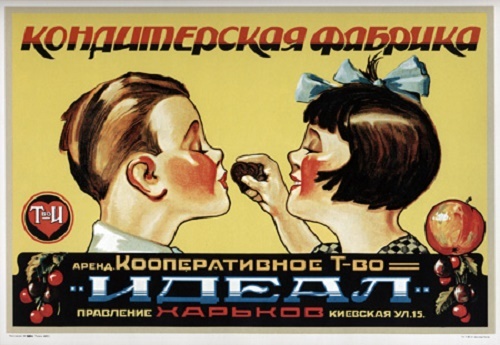 One of the founders of Soviet advertising of the 1930s became I. Bograd (1896-1938). 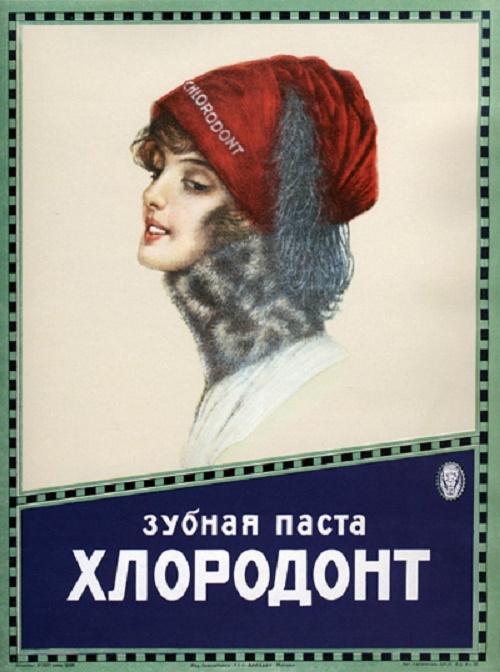 Bograd introduced into the commercial poster compositional techniques and the dynamics of the construction of film frame, the use of foreshortening and perspective, as, for example, in advertising cigarettes “Derby”. Font in posters of Bograd is not less important than the plot of the drawing. A classic example of this is advertising, “Sanit” popular toothpaste with the image of young pilots in the sky, on which is the white trail delicately inscribed the name of the pasta. In 1930s-50s a special role played expensive advertising products: crab and salmon canned food, caviar, perfume sets, fur, and etc. “Everyone should have time to try our tasty and tender crab!” convinces us the young woman from a memorable poster of 1930s (artist A. Miller). Another heroine of poster of this artist not only demonstrates the Leningrad perfume set of “White Night”, but dressed in the fashion of those years in the style of “Art Deco”. 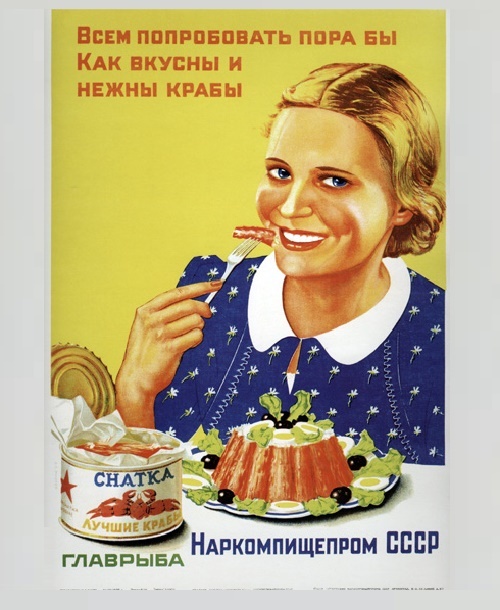 In the 1930s, Soviet consumers through advertising acquainted with many new products: pasteurized milk in glass bottles, mayonnaise, packaged meat and butter, dumplings, sausages, fresh-frozen vegetables and fish, food concentrates for quick cooking porridge, soup, jelly and confectionery products. 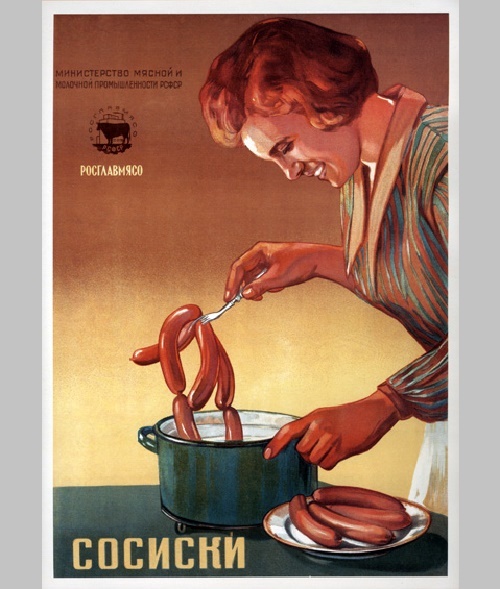 Advertising offers a ready dish “hot Moscow cutlets with the buns” (the author of the poster is unknown). It should be noted that all similar enterprises-producers in the country produced a strictly limited range of products that met approved standards. Factory products manufactured in Moscow, Leningrad, Saratov and Irkutsk had the same view. 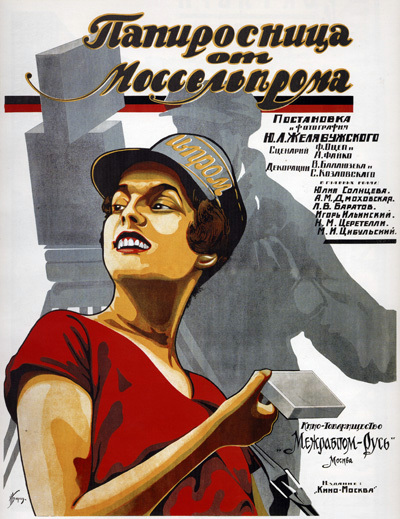 Therefore, advertising in Moscow was created for the whole country. 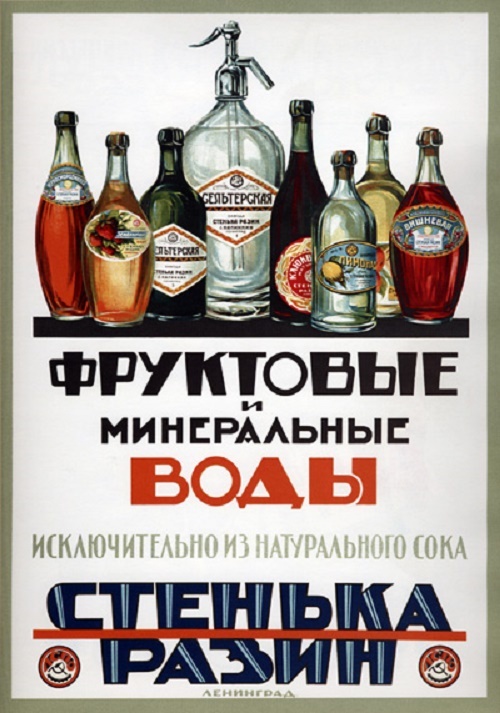 This is largely concerned alcoholic beverages, actively advertised in the late 30s (poster A. Pobedinsky “Bitters”). Permanent character of posters of A. Zelensky is a boy, a prototype of whom was the son of the artist – Boris. 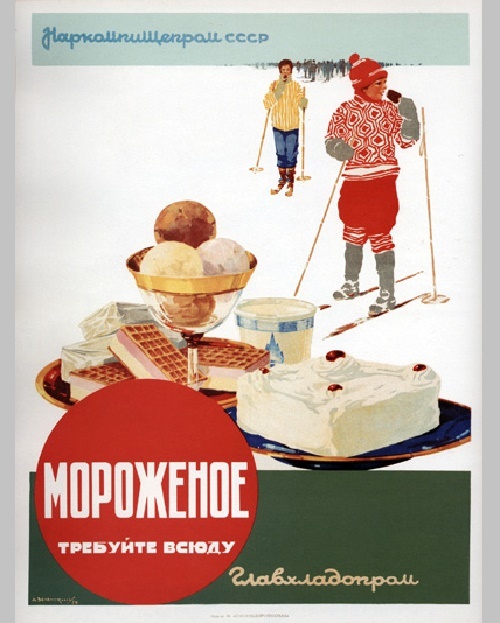 That’s why he was given the honor to show in advertising the most popular Soviet treat – ice cream. 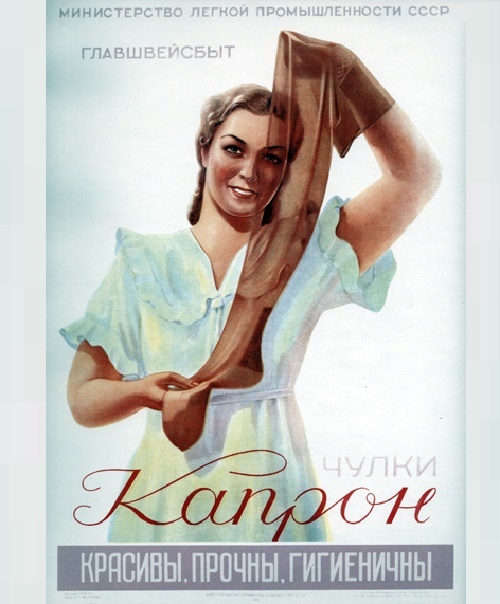 S. Sakharov (1906-1969) came to commercial advertising in the mid-1930s. Follower of the creativity of the old masters, he created one of the most romantic of advertising images “Smoke Captain cigars” poster in 1939. 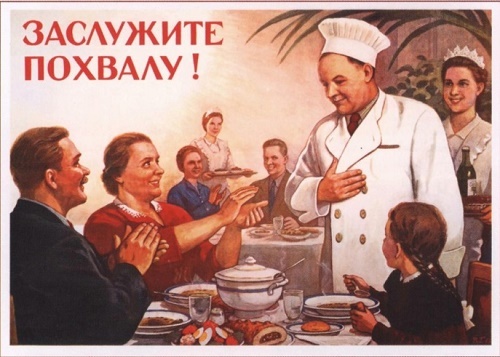 In 1940-1950 Sakharov became a recognized leader of the Soviet poster. His works are striking and unusual in color and accurate understanding of the impact of color psychology. 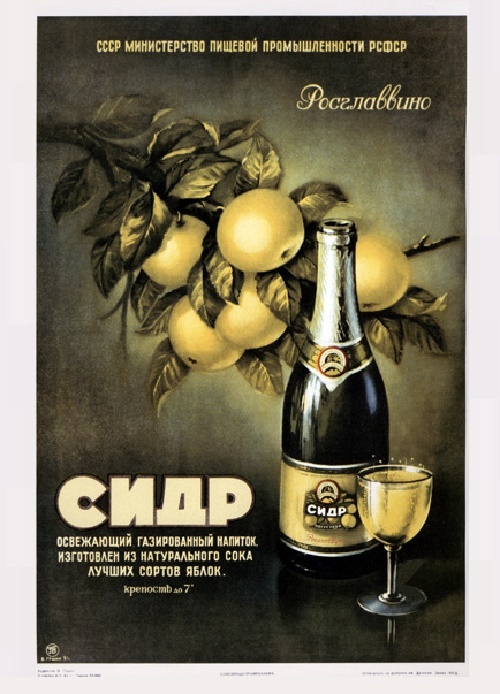 Advertising of citrus juice – drink from subtropical Black Sea coast of the Caucasus – still has not lost its charm and appeal. One of the findings of the artist became a symbol of the Soviet ice-cream – a penguin, favorite of children and adults. 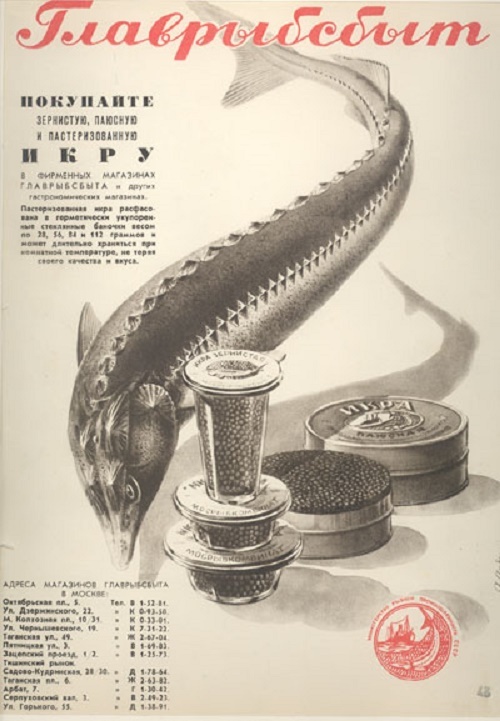 It is noteworthy that the herring advertising, created by Sakharov in 1959, migrated in the 1960s in numerous posters advertising seafood: ocean fish with exotic names such as eelpout, rockcod and mokrorusa behind which hunted Soviet fishing fleet. 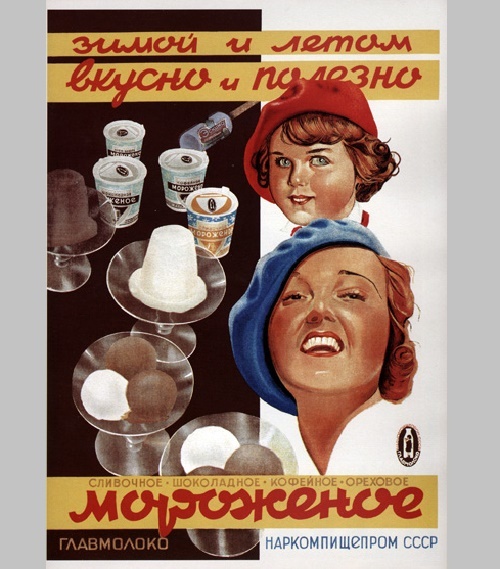 Among the artists of the postwar period should be noted N. Martynov (1912-1995), A. Andreadi (1907-1972) and V. Trukhachev (b.1917) who created the excellent advertising of fisheries products, perfumes and medicines, and whose work featured many “consumer” products. Trukhachev worked in the Central department store network in Moscow and, thanks to him, hundreds of thousands of residents of the capital got acquainted with the assortment of fabrics, hats, vacuum cleaners, TVs, and other industry innovations. 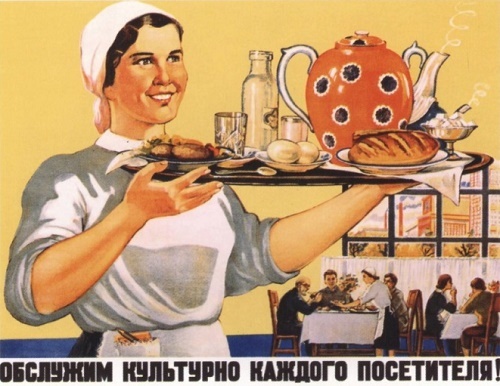 The end of the 1950s, with a large “virgin bread” and all kinds of caviar and fish on store shelves was the last stage of the Socialist abundance. 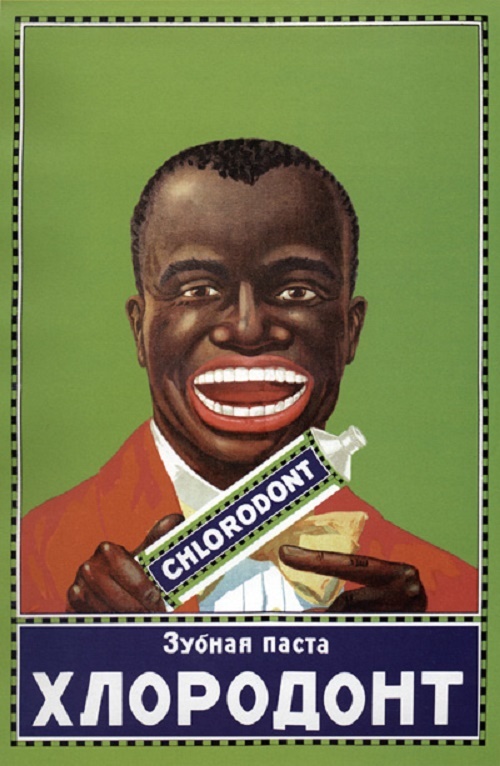 Advertisement of 1960s turned to consumer goods. 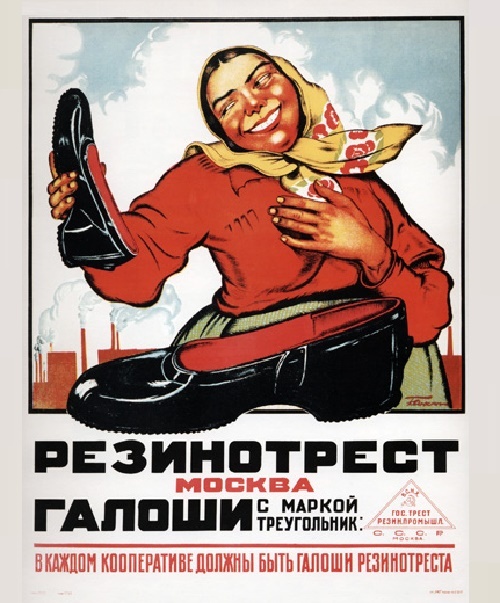 Fine female silhouettes on posters of E.Filimonov, S.Lapaev and placed on the walls of the department stores, side by side with advertising tarpaulin boots – great Russian national shoe, which successfully carried Soviet troops, grain farmers of Kazakhstan, conquerors of Siberia and the the young builders of BAM. 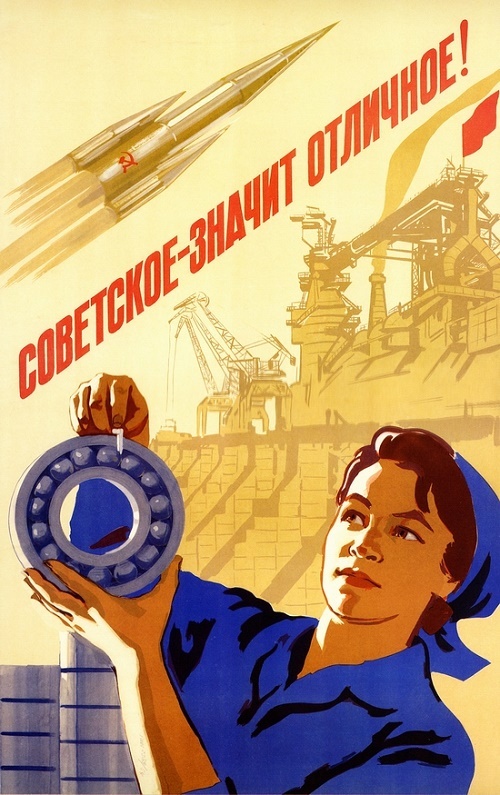 The USSR has entered a time of shortages and limited production of products and industrial goods. 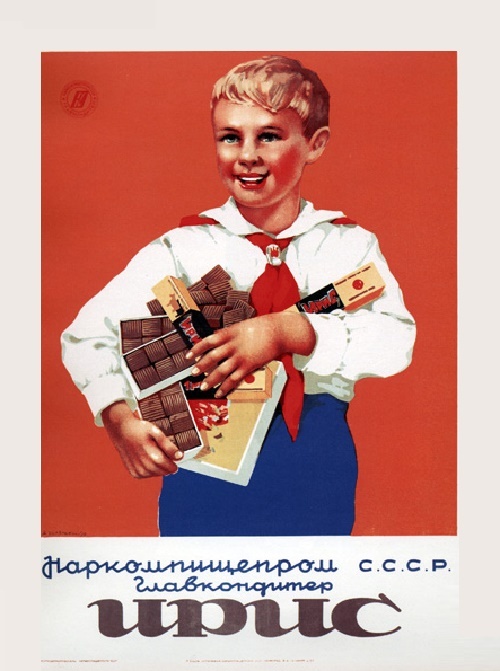 At the same period ended poster – optimistic paintings “Soviet means excellent” that adorned the walls of shops, defining a system of consumer values ​​and priorities, and symbolizing prosperity, seeming so close to the Soviet people.